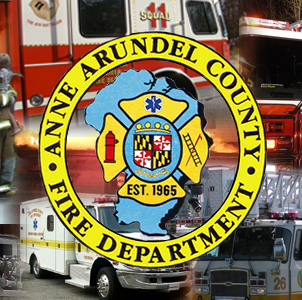 An Anne Arundel County firefighter is at the burn unit of the Johns Hopkins Bayview Medical Center being treated for first and second degree burns to the neck and ears after fighting a blaze in the Shipley’s Choice neighborhood of Severna Park. The call for the fire at 351 Green Aspen Court was reported just before noon and took more than fifty firefighters over an hour to contain the blaze. While there is no official cause, fire officials believe it was accidental in nature. Three residents of the home escaped and will be displaced while the home is being rebuilt. Initial damage estimates exceed $500,000. 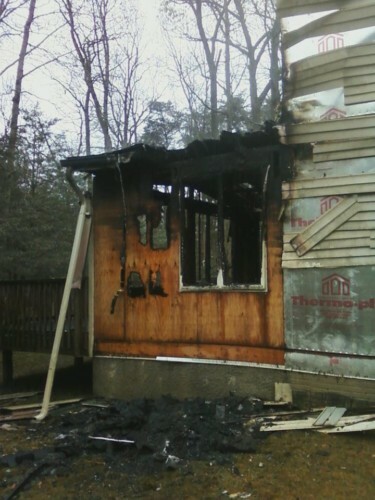 The following photo is courtesy of the Ferndale Volunteer Fire Company. « Children’s Theatre Of Annapolis Presents Disney’s Alice In Wonderland, Jr.